In the jungle of Chiapas, nestled on a thickly wooded ridge, is the ancient Mayan city of Palenque (pah-LEN-keh), perhaps Mexico’s most breath-taking archaeological park. During the Mayan period, it was believed to be one of the most important cities of its day. 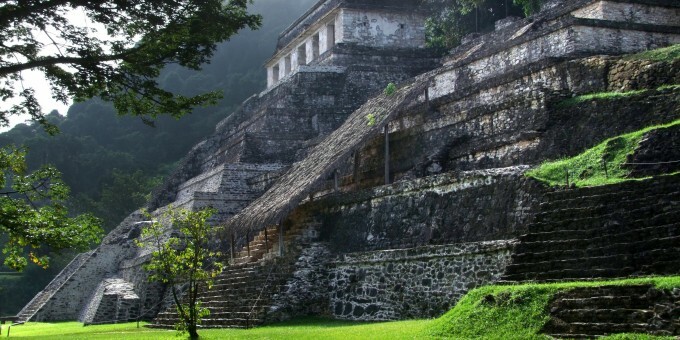 The name Palenque was given to it by the Spanish; its original name, like so much of Mayan history, is shrouded in mystery. The architecture and setting is impressive: surrounded by lush tropical forest and jungle, this site has a serene, mystical atmosphere that is apparent from the moment you enter the site. There is an important thing to keep in mind when you’re wandering around these ruins: everything you see was built without the benefit of metal tools, the horse or the wheel. This place was created exclusively with the tenacity of human labor. The surrounding forest is home to a huge variety of wildlife, such as the colorful toucan and monkeys, including howling monkeys. Palenque contained tombs of ancient leaders and rulers, and still today, excavations are on-going to uncover more of the mysteries and enigmas surrounding the ancient civilizations of the Maya. Some of the site remains closed to visitors as work to uncover the hidden treasures, reclaimed by nature over centuries of disuse, continues. A relatively small number of the estimated 500+ buildings present across the site have been excavated. Palenque is situated between some of Mexico’s principal tourist areas: Oaxaca, San Cristobal de las Casas and Cancun. It’s about an hour and half by road from the city of Villahermosa, which is also the nearest airport. It is too far for a day trip from either Oaxaca, San Cristobal de las Casas or Cancun, as your day will be taken up with traveling there and back and, in any event, it’s far better to stay at one of the nearby hotels and spend an entire day here: the site is extensive, and the trip is worth it. The best way to explore the site is to enter through the main (north) entrance, visit the main temples and structures (see notes below) and then wander around the fringe temples. There is plenty of space at this park, and shade if you need it. Many people enjoy sitting quietly under the shade of a tree, enjoying the serene ambiance. Palenque is not site to be rushed; it’s best enjoyed with plenty of time and at a gentle pace. The humid heat of the jungle will also encourage this. Once you have explored the park, there is a trail that leads out of the lower (southern) exit: the trail follows the Otrolum stream; it used to be possible to bathe in the waters, but due to abuse by some visitors, this is no longer allowed. Below is a summary of the main temples and structures; it is not exhaustive but is intended to give you an idea of what awaits you in Palenque. The principal, and most attractive, ruin is the Templo de las Inscripciones (Temple of Inscriptions). This is the first structure you will see as you climb the hill up to the old city. Adjacent to this Temple, you’ll find Templo XIII and Templo de las Calaveras (Temple of Skulls) – both are ancient burial temples; the former was only discovered as recently as 1993. El Palacio (The Palace) is an interesting and intricate maze of courtyards and corridors leading into rooms and includes the distinctive Tower at Palenque, once opened to visitors, but now closed off for safety reasons. Other Temples and structures of interest include Templo del Jaguar (Temple of Jaguar), Templo de la Cruz (Temple of the Cross), Templo del Sol (Temple of the Sun), Templo XIV, and Templo de la Cruz Foliada (Temple of the Foliated Cross). There is also an interesting museum on site which records Palenque’s history, as well as artifacts from the site. By Air: Limited flights between Mexico City and Palenque’s airport are available; the nearest major airport with daily flights to Palenque is Villahermosa, and from there you need to take a 2¼ hour road trip to the archaeology park. For detailed information about flights and flying, see the Mexperience guide to Air Travel in Mexico. By Car: Palenque is located about 90 miles southwest of Villahermosa. Take Highway 186 from Villahermosa. The road is in good condition, and the journey should take around 2 hours. It’s best to drive it during daylight hours only. Also see additional information about Driving in Mexico and Mexico’s Toll Roads on Mexperience. By Bus: Regular buses make the trip to Palenque from Villahermosa and San Cristobal de las Casas to Palenque. From Palenque local transport (buses / taxi) to the ruins is frequent and very inexpensive. For detailed information about bus transportation read the Mexperience guide to Bus Travel in Mexico. Opening Days & Times: 7 Days a week; 8 am to 5 pm. Modest admission charges apply and there are concessions for students, children and seniors. On Sundays, admission is free for Mexican citizens and foreign residents (with proof of residency). Important Tip: Palenque requires at least a whole day to enjoy and appreciate fully. 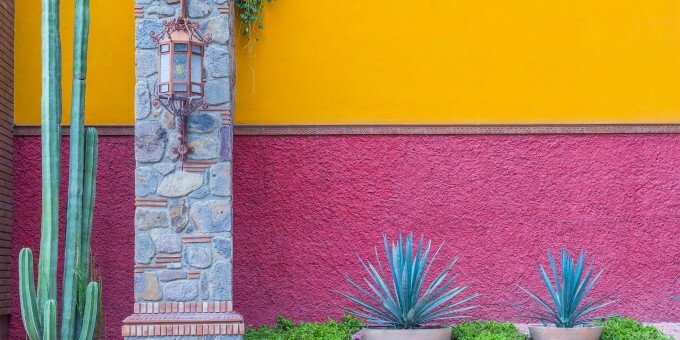 Our advice is to stay at a hotel in Palenque, get an early start and arrive at the park’s doors around 8 am: before the tour buses get there and before the day’s drenching temperatures pick up. The bounty of trees at this park provide plenty of shaded areas to escape from the intense sunlight. Better Overnight: Palenque is a big tour-bus destination. If you want to miss the crowds and get the most out a visit to this, in our opinion Mexico’s best and most awe-inspiring archaeological park, stay for a night or two at one of the hotels situated nearby. It’s by far the best way to experience Palenque. Accommodation: Because of its location, Palenque is best experienced as part of a local visit to the area with at least one overnight stay; either in Villahermosa or better, in Palenque itself. Palenque is not a realistic day trip from either Oaxaca, San Cristobal de las Casas, and especially not from Cancun. Photography & Video: A permit is required if you want to use a tripod to take photographs at the archaeological park. A small fee is made for the use of hand-held video equipment. Read the section on Mexperience Mexico Essentials about Video & Photography at archaeological sites in Mexico. Ideal Clothing & Footwear: Comfortable walking/hiking shoes with a non-slip sole are essential here—some of the buildings are steep and high. Wear strong climbing shoes if you plan to ascend the pyramids for the great views they offer. Dress for hot, humid weather. Palenque is in the middle of the jungle so dress using clothes made from light, natural fibers (e.g. cotton); essential accessories include sunscreen, insect repellent, a hat, and plenty of drinking water. Water bottles can be purchased locally, and there are toilet facilities on-site. See also Local Climate, below. Palenque has jungle weather: extremely hot and humid. Dress with light clothes that allow your skin to breathe; natural fibers (cotton) are best; avoid synthetics (e.g. polyester) and denim as you’ll feel very uncomfortable wearing them in this jungle climate. Bring sun screen, insect repellent and a hat. Carry plenty of water (if you forget, bottled water is on sale locally) and stay well hydrated at all times.